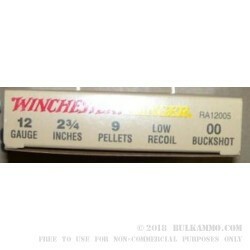 A case lot of Winchester Ranger 12 gauge 00 buck with 9 pellets in a low recoil 2 ¾” shell. This case lot is for 250 rounds in 50 boxes of 5 shells each. 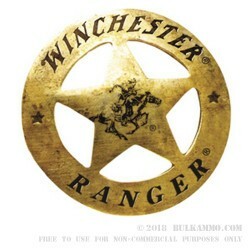 The Winchester Ranger line is a law enforcement specific line that is made with and for law enforcement and is available for the civilian market. The general performance is among the best in the Winchester eco-system and it holds its own across the board in mainstream offerings. This shotshell is a potent reminder of the potential of the buckshot loads and offers a reduced recoil experience which will be a welcome respite to shooters who need range time with the load, but can’t handle the heavy, brutal punishment of full powered loads. The buckshot loads can be quite robust as they are pushing out a lot of lead at a target. This slightly reduced recoil is a welcomed addition, as the performance of the round doesn’t suffer very much thanks to the performance of the projectiles and the amount of powder that still drives the shot cup. Suitable for use in any 12 gauge shotgun that can shoot 2 ¾” shells including semi-automatics. Most semi-autos will not need gas system adjustment.